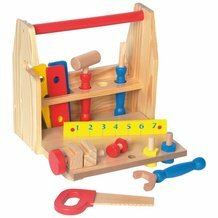 This tot-sized set is lots of fun for little handyboys and fix-it girls to tote anywhere they want. All their building and fixing will build problem-solving and fine motor skills, too. 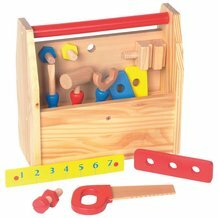 Wooden tool box is filled with smooth finished, painted wooden pieces. We do an adopt-a-kid program where I work and when I saw that my child wanted a tool set, this was the first one I thought of! I bought one for my grandson last year and he just loves it! It lets him be just like Papa. I'm sure my adopted child will love it too! Thanks Lehman's for a great gift! Purchased two of these for grandkids. Both love it and it was one of their favorite Christmas gifts.